Lone Oak at Stonebridge is a prestigious Ann Arbor condo community situated within the Stonebridge Golf Course and surrounded by mature vegetation. The complex consists of thirty units. Features include: fireplaces, garages, a great view and more. There are currently no condos listed for sale and so far this year, 2 have sold. $314,900. 4869 Lone Oak Ct., Ann Arbor. 1270 square feet with 2 bedrooms and 2.0 baths. $310,000. 4857 Lone Oak Ct., Ann Arbor. 1270 square feet with 2 bedrooms and 2.0 baths. Last year at Lone Oak at Stonebridge, 4 condos sold with an average sale price of $317,100 and an average price per square foot of $234.00. The 2 condos sold this year have an ASP of $312,450, down slightly, and an A$/SF of $246.00, up 5%. To learn more about condo values at Lone Oak at Stonebridge, contact the real estate specialists with The Bouma Group at (734)761-3060 or email info@bouma.com. View more Ann Arbor condominiums here! Lone Oak at Stonebridge Condos is a located within the Stonebridge Golf Course and Country Club community. 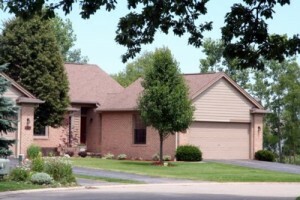 These luxurious Ann Arbor Condos feature spacious, detached units with lovely views of the golf course, pond, or woods. There are currently 0 units for sale and in the past 12 months, 1 unit has sold. $230,000. 1448 sq. ft. +1355 in finished lower level, 3 bedrooms and 3 baths. Due to the small size of the Lone Oak at Stonebridge complex, typically only 1 unit sells per year. For immediate notification of new listings at Lone Oak, or information on values at the nearby Ponds at Stonebridge, Stonebridge Heathers, or Fox Glen, contact the Ann Arbor Condo specialists at The Bouma Group of Keller Williams today at 734-761-3060 or info@bouma.com. To view up-to-the-minute listing and sold data, plus floor plans, amenities and more for Washtenaw County, visit the Ann Arbor Condo Hotline here!